You might have heard that the weather in the West Highlands isn’t always balmy, sunny and dry. The weather forecast prior to our current Easter at a rented house suggested that we were due for more than our fair share of rain. But did this put us off? Of course not. Because this is part of the attraction: you never know what the day will hold. No matter what the weather forecast says, you will get some sun, some showers, some wind to dry you off and you will get some picturesque clouds and stunning light. The quality of the light is special in the west Highlands: bright sunshine slanting in from under clouds to flood the golden mountainsides with light. Weather is a spectator sport. Find a window seat, look out at the mountains reflected in the loch, and wait for the weather to start the show. Due to the West Highland weather, particularly, it seems, on this holiday, there is always water aplenty rushing down the mountains. White ribbons of water flow down every hillside, braiding around rocks and heather. Almost everywhere are waterfalls, from the small, to the mighty. Gorges with rowans clinging to the side and leaning into the spray are where you will find a miniature forest of incredible lichens, mosses and ferns. Smoothed rocks for basking on during a dry summer day, transform into torrents of wild water after a night of rain. We used the rain to advantage the last couple of days to explore the burns flowing down the hill behind the house. An ordinary burn is made extraordinary once you step into it and start to follow the course of the water, scrambling over mossy boulders, balancing along dead trees washed down and wedged across the stream and ducking under tree branches growing over the vertiginous bank. Mosses and lichens cover everything and it felt like we were the first people to discover this lost world. We were out with six children aged between 6 and 11, and it became a real adventure for all of us, helping the children up little waterfalls and bigger waterfalls, until we were halted by a 10m long chute of water. It’s not usually the children begging to go on while the adults suggest a retreat to the house for tea, but this time the kids dragged us onto the bank and around the obstacle to continue the adventure. They returned today to conquer the waterfall, with ropes and harnesses, and every child climbed through the rushing torrent, made it to the top and declared themselves victorious. 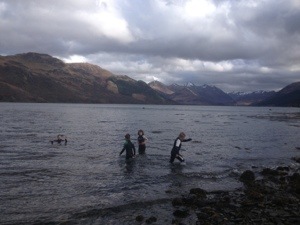 Wetsuits, wellies and waterproofs are the essential outfit for kids on holiday in the west highlands. They were all dressed like that for the gorge ascent. A friend introduced us to this stylish and functional holiday wear on another Easter holiday: wetsuits to keep warm, waterproofs to keep off the wind, and wellies. Children will be happy on the beach all day dressed like this. As the maxim says ‘there is no such thing as inclement weather, only inappropriate clothing’. There are a few species that everyone wants to see: I am always looking out for eagles. I know there should be white tailed eagles around and I am hoping to see a golden eagle. 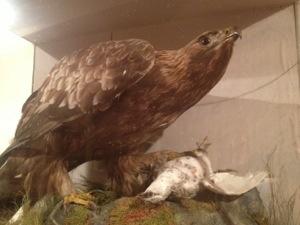 It wasn’t too far from here, when climbing a ridge, a golden eagle appeared just below me, rising on the up-draft. For a few moments, it was only a few wing-spans from me and then suddenly banked, soaring out of sight over the ridge. unfortunately in a glass case in the house, haven’t seen the real thing yet this holiday. Isn’t north west Scotland just the very best place for walking? I love low level coast and loch-side walks, but I especially love the mountains, I never get bored in the mountains. Not least because weather and conditions make every walk one-of-a-kind. While the children were ascending the waterfall, I took the chance to get into the mountains. We were rained on (a bit) we were blown on (which dried us out) and we had a constantly changing vista as clouds passed, drew in, and then parted. We climbed up over a bealloch (coll) along a path that was once used by soldiers and those droving their cattle. It was high, around 700m at the top, but we were surrounded by higher mountains. We met no-one all day, and we looked over into a glen, completely remote. If we had carried on walking down the glen and southwards we would have reached Knoydart, the largest area of uninhabited land, wild land, in Britain. 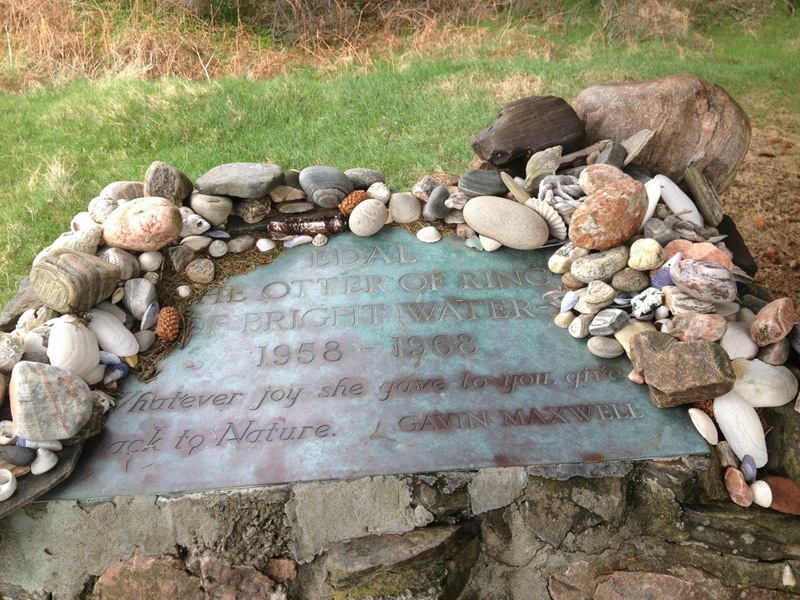 On the second day of the trip, we visited Sandaig, the site where Gavin Maxwell wrote Ring of Bight Water. It is a deserted place, the house is gone and two monuments, one to Maxwell and one to Edal the otter, bear testament to the lives that were lived in that place. It certainly felt wild, with a derelict cottage and an expanse of rock, sand, shingle and sea. The poignant air of the place brought to life in the book, now deserted, reminded me that most of the wild glens, and coasts of the West Highlands, places that we now call wilderness, were once filled with dwellings. Thousands of people living off the land, with homes by lochs and in the glens, and sheilings where, in the summer, women and children stayed with the cattle at the high pastures. 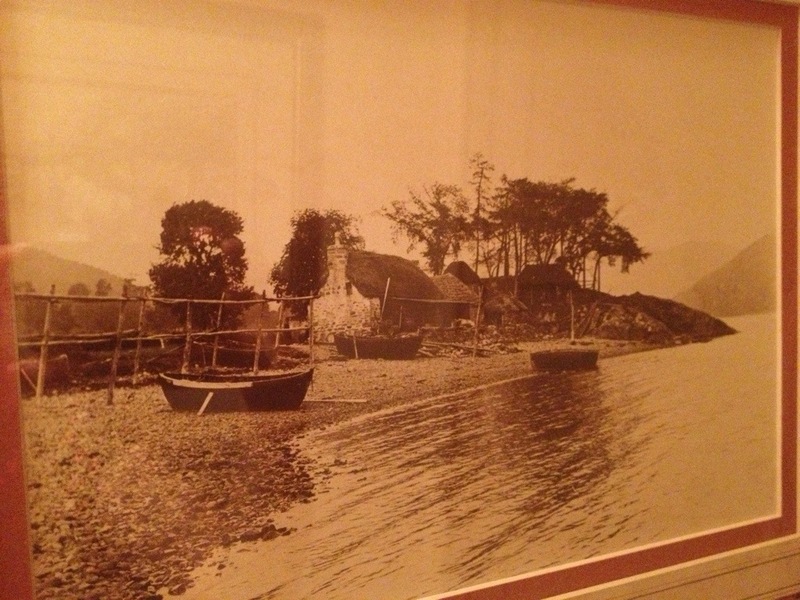 The house we are staying in has a few ancient browning photographs of blackhouse settlements on the walls. The houses are made of woven hurdles and stone and thatched with heather. In one photo a group of children, barefoot and dirty, stand with their mother at the door to the house. I think I recognise the place as just around the cost from here. There is nothing left there now but stones. A photo on the wall of the house we are staying in shows some of the communities in areas of the coastline now deserted. Because the West Highlands are wild, and untamed there isn’t always a bridge to hand, even on marked paths. This isn’t strictly something that I love about the West Highlands, but I crossed a freezing and rocky mountain burn today, in bare feet to keep my boots and socks dry. It was very sore and there were patches of snow on the ground, and I am proud of it, so I thought I’d put it in…. Part of the joy of the wild, the wet and the windy is the warming up at the end. After the day at Sandaig we clustered wet-suited and wet children round a driftwood fire and they toasted themselves and their marshmallows. Obviously, good for warming you up, especially in front of a wood-burning stove. And also, as I have found out, good for cooling down. On our second night I was tasked with the communal meal and made whisky and honey ice cream. Having forgotten the key ingredient I borrowed some from the bottles brought by my friends and so discovered my two favourite flavours of ice-cream: Talisker and Highland Park.